As one looks at a map of Italy, you notice immediately that Italy is mostly surrounded by water, bordering on 5 seas with approximately 7600 Km of coast line. Also, you can’t help but notice the hilly and mountainous terrain that makes up much of the Italian landscape. These two geographical characteristics have played important roles in Italian food history which dates as far back as the 4th century BC. Also, and not understood by most North Americans, other cultures have played a role in influencing the Italian culture including their history of the Italian food. Over the centuries those who “came to visit”, including, but not limited to, the Greeks, Arabs, Spanish, French, Austrians, and perhaps even the Vikings have left a mark not only on the culture of Italy but also on their daily menu. Many of these influences still exist today. In the north of Italy along its borders with France, Switzerland, Austria, and Slovenia, there is a blending of cultures, on both sides. It can be heard in the local dialects spoken and tasted in the local cuisine. These regions include Liguria, Piemonte, Valle d’Aoata, Lombardia, Trentino Sud Tirolo, Veneto and Friuli Venezia Guilia. Italy is divided into 20 regions. 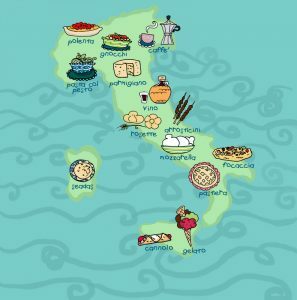 15 of these regions have coast lines along one of Italy’s 5 seas, a fact that has played an important part in Italian food history. Early every morning the fishing boats return to their ports, as they have for the past couple of millennium or more, with their catch, which is always quite varied. Italians have developed a huge array of recipes to include the day’s catch. Despite the fact that Piemonte, Valle D’Aosta, Lombardia, Trentino Sud Tirol and Umbria lack access to the seas, the sea is not too far, so fresh sea food arrives to their markets, only a bit later in the morning. Also, freshwater fish is available from the lakes of Piemonte and Lombardia in the north. As I mentioned earlier, Italy’s landscape is quite mountainous. However there is a break from the hills and mountains following along the Po River in the north. Running in a west to east direction, the Po River starts at the western Italian Alps and empties into the Adriatic Sea. The rich volcanic soil of the Po Valley produces a variety of important crops including two of the staples of the north, risotto, rice: arborio rice to be exact, grown in the region since the 15th century. In fact Italy is the largest producer of rice in Europe. There are several recipes for risotto including hot and cold dishes, usually mixed with a combination of vegetables, meat, cheese or mushrooms. The other important crop of the north is corn, which is milled into meal. Polenta, a dish made with this meal, is cooked in salted water until firm, topped or bottomed with a variety of meats or cheeses or served as a side dish with roasted meat. Risotto and Polenta is often preferred over pasta by the peoples of the north. What we refer to as Italian pasta today, made from Durum wheat semolina has its origins, more or less, from the Arabs of Libya, during their occupation of Sicily during the late 7th century. So this predates, by 6 centuries, the popular North American notion that pasta was brought back to Italy by Marco Polo upon his return from China. It should also be noted that the Italian government regulates that dry pasta can only be made using Durum wheat semolina, which gives the finished product a yellowish colour. This also allows for that al dente texture Italians looked for when cooking pasta. 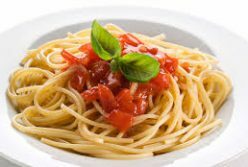 Pastas produced outside of Italy may use wheat flour, which disallows the al dente effect and results in a more starchy pasta. The countless fertile nooks and valleys that make up the landscape of Italy are ideal for the production of a vast array of fruits, vegetables and legumes, all of which are highly prized by Italians and are at the root of Italian food history. It’s interesting to note that the original author of Italian cuisine, Archestratus, a Greek from the city of Syracuse in Sicily back in the 4th century BC wrote that ingredients should be of the best of quality and in season and that the flavours should not be covered up by herbs or spices. After more than 2 millennium, Italian food history continues to be a part of every day life for Italians as their carry on the tradition of keeping their recipes simple and by demanding high quality ingredients, a demand which is upheld, and protected by various government initiatives to this day.